In June 2004, the Pointe-au-Chien Indian Tribe, the Isle a Jean Charles Band of the Biloxi Chitimacha Confederation of Muskogees, the Bayou Lafourche Band of the Biloxi Chitimacha Confederation of Muskogees, and the Grand Caillou Dulac Band of the Biloxi Chitimacha Confederation of Muskogees were officially re-recognized as tribal communities and recognized as Indian tribes by the State of Louisiana. PACIT AND BCCM MEMBERS WORKED TOGETHER TO OBTAIN STATE RECOGNITION. Chief Randy Verdun of the Bayou Lafourche Band of Biloxi-Chitimacha, Pointe-aux-Chenes School Principal Dawn Lafont, and PACIT Tribal Attorney Patty Ferguson-Bohnee testified on behalf of effort. Resolutions to recognize the tribes passed committees in both chambers the same day. Left to Right: Theresa Dardar (PACIT), Second Chairman Donald Dardar (PACIT), Chief Randy Verdun (BL-BCCM), Patty Ferguson-Bohnee (PACIT Tribal Attorney), Chief Albert Naquin (IJC-BCCM), Councilman Ernie Dardar (IJC-BCCM), Councilman Ronald Courteaux (GCD-BCCM), Principal Dawn Lafont (Pointe-aux-Chenes Elementary). Shirley Verdin (PACIT). Kneeling: Secretary Michelle Matherne (PACIT), Elder Theresa Billiot (PACIT). Also present for the hearings but unavailable for the picture was Elder Arline Naquin (PACIT). 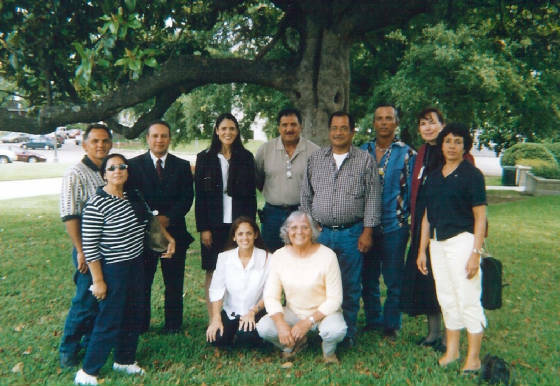 Lafourche Parish and Terrebonne Parish have both recognized the Pointe-au-Chien Indian Tribe, and on May 27, 2008, the Terrebonne Parish School Board recognized the Pointe-au-Chien Indian Tribe. The Pointe-au-Chien Indian Tribe has petitioned the federal government to be acknowledged as an Indian tribe. The Tribe's petition was submitted in 1996. The process is time consuming, expensive, and requires expert assistance. The Tribe has no funding, and welcomes volunteers who can lend assistance in this process. The Assistant Secretary of Indian Affairs issued a proposed finding on May 27, 2008 providing direction as to the additional work the Tribe must perform to meet the seven mandatory criteria. The Tribe met criteria (a), (d), (f), and (g). The Tribe must provide more evidence to meet criterion (e), which requires the Tribe to prove that it descends from a tribe or tribes that came together to create a single autonomous entity. Criterion (e) must be proved in order for the Tribe to meet (b) and (c) prior to 1830. The Tribe met criterion (b), social community, proving that it is a distinct community from 1830 to the present. The Tribe also met criterion (c), political community from 1830 to 1940 and from 1988 to the present. The Tribe has been successful thusfar, considering that most of the evidence submitted by Pointe-au-Chien was compilied by volunteers including tribal members, not researchers or consultants. From the time of the petition submission to the present, volunteers have assisted us in the following areas: colonial history, ethnography, linguistics, and genealogy. We do need volunteers in the areas of demography, archaelogy, anthropology, history, linguistics, historical geography, and ethnography. We still need more assistance with research and analyzing documents. We do not have a complete analysis of the documents we have gathered to date. We have conducted over 40 oral histories of our community. If you have any documents related to the history of the tribes in South Louisiana or know where we can locate primary resources, please contact us as the Bureau of Indian Affairs wants a comprehensive comilation and analysis of all available documents to prove that we have existed from historical times to the present. Some outsiders are confused as to our relationship with the United Houma Nation and the Biloxi-Chitimacha Confederation of Muskogees. Click FAQ for more information with regards to those questions. Because this is such an expensive process, the Tribe is accepting donations towards this project. The Federal Acknowledgment Process includes seven mandatory criteria that a tribe must meet in order to obtain federal acknowlegment under 25 CFR Part 83. The criteria are outlined in 25 CFR 83.7. §83.7 Mandatory criteria for Federal acknowledgment. (a) The petitioner has been identified as an American Indian entity on a substantially continuous basis since 1900. Evidence that the group's character as an Indian entity has from time to time been denied shall not be considered to be conclusive evidence that this criterion has not been met. Evidence to be relied upon in determining a group's Indian identity may include one or a combination of the following, as well as other evidence of identification by other than the petitioner itself or its members. (1) Identification as an Indian entity by Federal authorities. (2) Relationships with State governments based on identification of the group as Indian. (3) Dealings with a county, parish, or other local government in a relationship based on the group's Indian identity. (4) Identification as an Indian entity by anthropologists, historians, and/or other scholars. (5) Identification as an Indian entity in newspapers and books. (6) Identification as an Indian entity in relationships with Indian tribes or with national, regional, or state Indian organizations. (b) A predominant portion of the petitioning group comprises a distinct community and has existed as a community from historical times until the present. (i) Significant rates of marriage within the group, and/or, as may be culturally required, patterned out-marriages with other Indian populations. (ii) Significant social relationships connecting individual members. (iii) Significant rates of informal social interaction which exist broadly among the members of a group. (iv) A significant degree of shared or cooperative labor or other economic activity among the membership. (v) Evidence of strong patterns of discrimination or other social distinctions by non-members. (vi) Shared sacred or secular ritual activity encompassing most of the group. (vii) Cultural patterns shared among a significant portion of the group that are different from those of the non-Indian populations with whom it interacts. These patterns must function as more than a symbolic identification of the group as Indian. They may include, but are not limited to, language, kinship organization, or religious beliefs and practices. (viii) The persistence of a named, collective Indian identity continuously over a period of more than 50 years, notwithstanding changes in name. (ix) A demonstration of historical political influence under the criterion in §83.7(c) shall be evidence for demonstrating historical community. (v) The group has met the criterion in §83.7(c) using evidence described in §83.7(c)(2). (c) The petitioner has maintained political influence or authority over its members as an autonomous entity from historical times until the present. (1) This criterion may be demonstrated by some combination of the evidence listed below and/or by other evidence that the petitioner meets the definition of political influence or authority in §83.1. (i) The group is able to mobilize significant numbers of members and significant resources from its members for group purposes. (ii) Most of the membership considers issues acted upon or actions taken by group leaders or governing bodies to be of importance. (iii) There is widespread knowledge, communication and involvement in political processes by most of the group's members. (iv) The group meets the criterion in §83.7(b) at more than a minimal level. (v) There are internal conflicts which show controversy over valued group goals, properties, policies, processes and/or decisions. (i) Allocate group resources such as land, residence rights and the like on a consistent basis. (iv) Organize or influence economic subsistence activities among the members, including shared or cooperative labor. (3) A group that has met the requirements in paragraph 83.7(b)(2) at a given point in time shall be considered to have provided sufficient evidence to meet this criterion at that point in time. (d) A copy of the group's present governing document including its membership criteria. In the absence of a written document, the petitioner must provide a statement describing in full its membership criteria and current governing procedures. (e) The petitioner's membership consists of individuals who descend from a historical Indian tribe or from historical Indian tribes which combined and functioned as a single autonomous political entity. (ii) State, Federal, or other official records or evidence identifying present members or ancestors of present members as being descendants of a historical tribe or tribes that combined and functioned as a single autonomous political entity. (iii) Church, school, and other similar enrollment records identifying present members or ancestors of present members as being descendants of a historical tribe or tribes that combined and functioned as a single autonomous political entity. (iv) Affidavits of recognition by tribal elders, leaders, or the tribal governing body identifying present members or ancestors of present members as being descendants of a historical tribe or tribes that combined and functioned as a single autonomous political entity. (v) Other records or evidence identifying present members or ancestors of present members as being descendants of a historical tribe or tribes that combined and functioned as a single autonomous political entity. (2) The petitioner must provide an official membership list, separately certified by the group's governing body, of all known current members of the group. This list must include each member's full name (including maiden name), date of birth, and current residential address. The petitioner must also provide a copy of each available former list of members based on the group's own defined criteria, as well as a statement describing the circumstances surrounding the preparation of the current list and, insofar as possible, the circumstances surrounding the preparation of former lists. (f) The membership of the petitioning group is composed principally of persons who are not members of any acknowledged North American Indian tribe. However, under certain conditions a petitioning group may be acknowledged even if its membership is composed principally of persons whose names have appeared on rolls of, or who have been otherwise associated with, an acknowledged Indian tribe. The conditions are that the group must establish that it has functioned throughout history until the present as a separate and autonomous Indian tribal entity, that its members do not maintain a bilateral political relationship with the acknowledged tribe, and that its members have provided written confirmation of their membership in the petitioning group. (g) Neither the petitioner nor its members are the subject of congressional legislation that has expressly terminated or forbidden the Federal relationship.